Pine trees are lined up around the Band of Trees Ceiling Light. This rustic pine tree ceiling light is Made in the USA. Pine trees are lined up around the Band of Trees Ceiling Light. 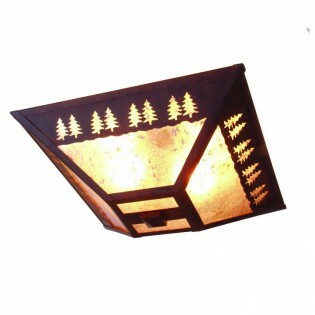 This rustic pine tree ceiling light measures 17" x 17" x 9" and it uses two 60 watt regular base light bulbs. Made in the USA.